City College Graduation Ceremony 2011 | Educational Group E.G. 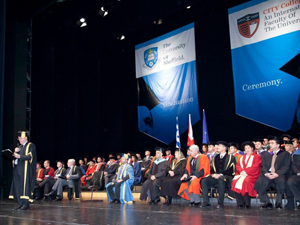 Stratigakis S.A.
CITY College, International Faculty of the University of Sheffield held a prestigious Graduation Ceremony at the Thessaloniki Concert Hall, on Saturday, 26th of November 2011. More than 250 talented Bachelors, Masters and PhD graduates who completed their studies at CITY College in Thessaloniki were awarded their certificates from the Vice-Chancellor of the University of Sheffield, Professor Keith Burnett.